We’ve had Greens in City Hall since 2000 when the Assembly and Mayor were first created, and our party’s record is incredible. A decisive reason London has Living Wage employers and any kind of half decent record on cycling is down to the campaigns and actions of Greens in City Hall, doing things like saving the cycling budget and ensuring the Living Wage Unit was created. The impact of estate regeneration schemes on Londoners – one of the fiercest issues in London politics – was exposed and measured by Green AM Darren Johnson in 2016. This was a huge step in helping residents on threatened estates link up their battles and show the bigger picture of destruction and social cleansing across our city. 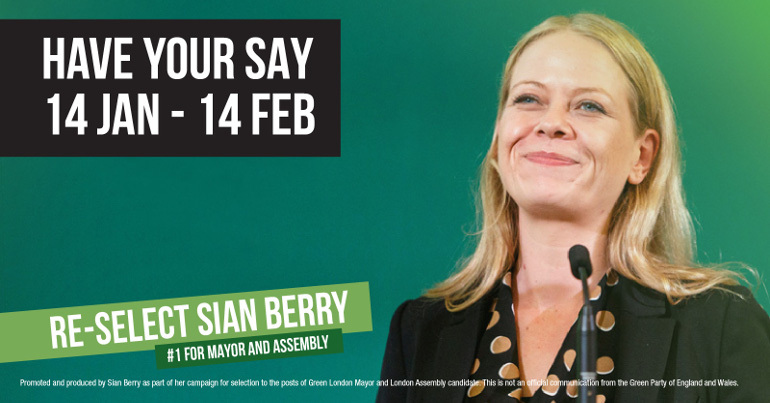 Sian Berry is Co-Leader of the Green Party of England and Wales, a member of the London Assembly, and a Councillor in Camden. She has twice previously stood in the London Mayoral election, in 2008 and 2016. In 2016, she received the party’s highest ever vote share – 5.8% – beating the Liberal Democrats to third place in the process. How do we secure a pesticide free London?